One of my favourite books: What the Buddha Never Taught by Tim Ward. There is a place in the jungles of northeastern Thailand where Westerners can live according to the monastic rules laid down over 2,500 years ago by the Buddha. Author and journalist Tim Ward sought enlightenment and spent a season in this unique Buddhist monastery-one of the strictest in Southeast Asia. His affectionate “behind the robes” book about the rigors and foibles of monastic life at Wat Pah Nanchat has become a modern Buddhist classic. It’s now available on Kindle and paperback. Highly recommended. SWM, 26YO with shaved head and beer belly seeks a double-jointed female supermodel who owns a brewery and grows her own. Access to free concert tickets a plus, as is having an open-minded twin sister. It ain’t bragging if you’ve got the goods. In one of the most unlikely scenarios anyone could have conceived, The Shark is back in contention at the British Open. After a three year absence, two-time champion Greg Norman is making his return to The Open Championship this week at Royal Birkdale. It will be Norman’s 26th appearance in the event and first since finishing T60 at St. Andrews in 2005. One of my best golf moments ever was watching Norman win the British Open in 1986. On Rocco’s Sony Watchman. While hiking in the Rockies. He and Tiger are my two favourite golfers. Ever. Greg Norman will take a two-stroke lead into Championship Sunday after continuing his improbable run for a third Open title. The Shark showed the heart of a champion Saturday at Royal Birkdale, grinding out a stellar 2-over par 72 in winds gusting 40 miles per hour. The 53-year old World Golf Hall of Famer is the oldest player to lead a major after 54 holes and will be paired with defending champion Padraig Harrington in the final round. His recent wedding to former tennis champ Chris Evert must agree with him. A mountain pine beetle infestation has already killed off billions of trees in British Columbia, Canada. The mountain pine beetle epidemic in British Columbia is coming to a close, but only because the pests are running out of food, a forestry representative says. The beetles kill the trees by boring through the bark into the phloem layer on which they feed and in which eggs are laid. Pioneer female beetles initiate attacks, and produce pheromones which attract other beetles and results in mass attack. The trees respond to attack by increasing their resin output in order to discourage or kill the beetles, but the beetles carry blue stain fungi which, if established, will block the tree resin response. Over time (usually within 2 weeks of attack), the trees are overwhelmed as the phloem layer is damaged enough to cut off the flow of water and nutrients. In the end, the trees starve to death, and the damage can be easily seen even from the air in the form of reddened needles. Entire groves of trees after an outbreak will appear reddish for this reason. Usually older trees die faster. After particularly long and hot summers mountain pine beetle population can get out of hand and that’s when there starts to be a problem. There are too many beetles and they start killing off big areas of trees. I don’t know. I would think some predator would take an advantage of the infestation. Rocky Mountain National Park in Colorado used selective burning to try to stem the beetles. Alberta is trying some preemptive prescribed burns. Others are clear cutting though there’s very little demand for the wood. 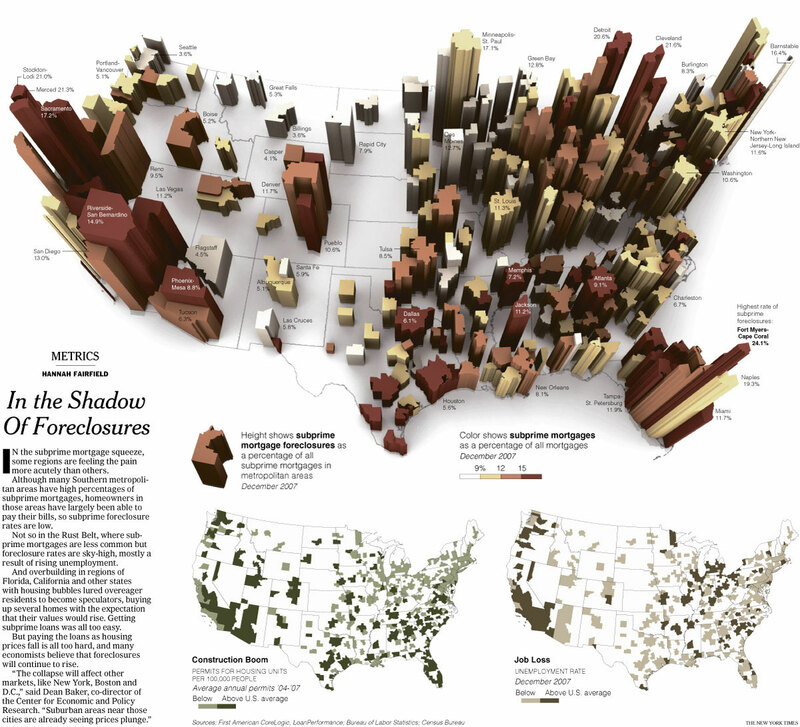 brilliant map of foreclosures U.S.A.
Posted on June 2, 2008 Categories miscellaneousLeave a comment on brilliant map of foreclosures U.S.A.
Just trying this service for the first time. You must have an account with one of these Canadian banks. See a video explaining of how it works. Leave a comment if you’ve used it and have an rave or rant. Cost $1.50 / transaction.